With my animation I want to study mathematical concepts of irrationality and disorder and give the audience some ideas they never have thought before. 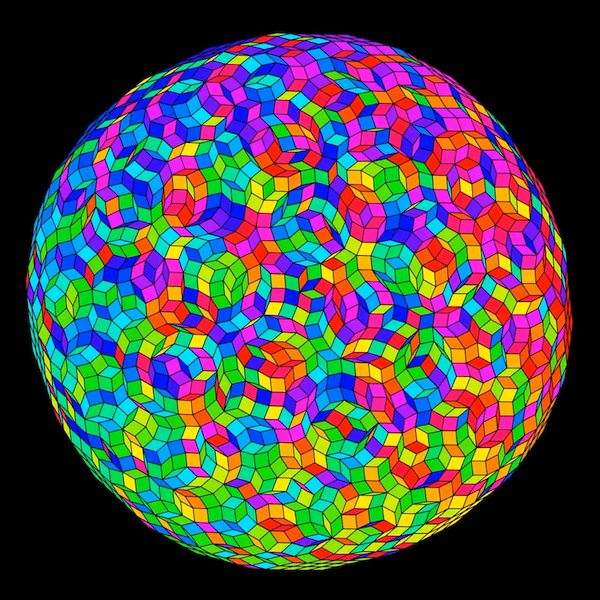 Every image in the animation is made using only rhombi. In the first half of the animation a new set of rhombi is generated by adding N rhombi in new direction. 60 generations of rhombi are generated and total count of rhombi is about 1500 (max 60 * 59 / 2) while some rhombi are so thin that they are not visible. An image is rational when the rhombi have same shape. Then the border of the image is some symmetric polygon. When an image is irrational rhombi have more variance with their shapes and the border of the image is near circle. An image has order when faces with same shape and orientation are near each other. In the beginning of animation images are in order. A change in order happen by discrete steps where three rhombi with mutual vertice change place so that shape of their combination does not change.